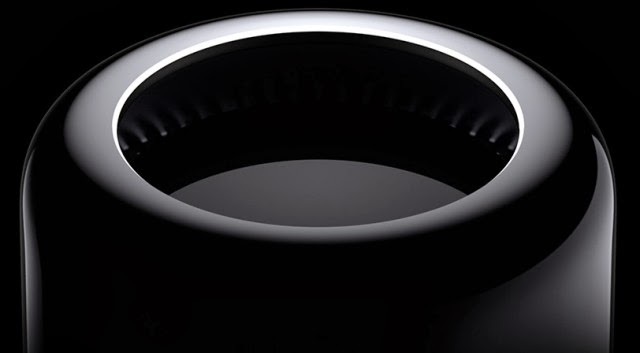 The new, cylindrical Mac Pro is a long-overdue update to Apple’s line of workstation-class PCs. Compared to the original Mac Pro brushed aluminium tower (pictured at the end of the story), the new model is an almost shockingly diminutive cylinder. It’s hard to appreciate just how small the Mac Pro is until you see it in real life — it is tiny. The tower, fully kitted out, weighed in the region of 40 pounds (18 kg) — the new Mac Pro is just 11 pounds (5 kg). Likewise, when it comes to other dimensions like height and length, the new Mac Pro is just 10 inches (25 cm) tall and 6.6 inches (16.7 cm) across. It is hard to believe that, in just even years, the Mac Pro’s volume has been reduced by at least 10 times.